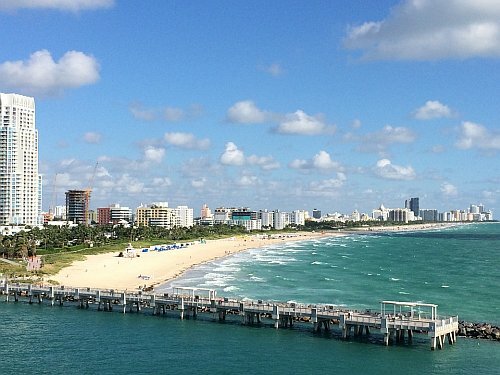 WestJet has dropped the price of some of their winter 2019 flights from Vancouver to Miami, Florida down to $243 CAD roundtrip including taxes. Update 11/7 @ 4:30 PM PST - It looks like these are all higher now. The cheapest prices are now $329 CAD roundtrip. A few long trips in March 2019. 3. On Priceline, the price will show up as $197 USD roundtrip including taxes. Priceline is *always* in $USD. This will work out to $266 CAD roundtrip when booked using a Canadian credit card, and including the typical 2.5% credit card foreign exchange fee. 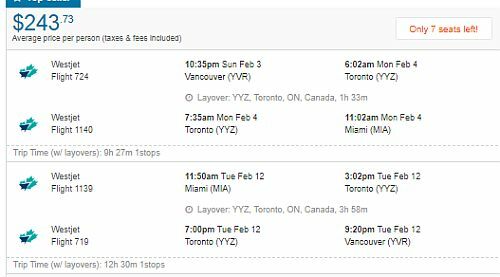 2 Responses to "Vancouver to Miami, Florida - $243 to $266 CAD roundtrip including taxes"
Just booked this deal. I cannot believe how cheap it is! Thanks, Chris!